Multilateral negotiations on climate change are slow and often disappointing. Accordingly, policy and scholarly attention has been diverted towards climate-policy developments elsewhere. Many have explored the progress made by regional governments, city networks, and transnational partnerships in tackling climate change. Yet, the potential contribution of trade agreements to climate governance remains underexplored. In a study soon to be published, Sikina Jinnah and I discuss the contribution of trade agreements to the climate governance. Using the TREND analytics, we have identified several categories of provisions that directly address climate change. The most common climate-related provisions address renewable energy or energy efficiency. Some agreements also directly address climate mitigation and adaptation efforts. Other agreements require parties to ratify or implement the United Nations Framework Convention on Climate Change and the Kyoto Protocol. The European Union is a pioneer in the integration of trade and climate agendas. Even before the publication of the first report of the Intergovernmental Panel on Climate Change (IPCC), the EU took the opportunity of the 1989 revision of the Lomé Convention to include a reference to the greenhouse effect. 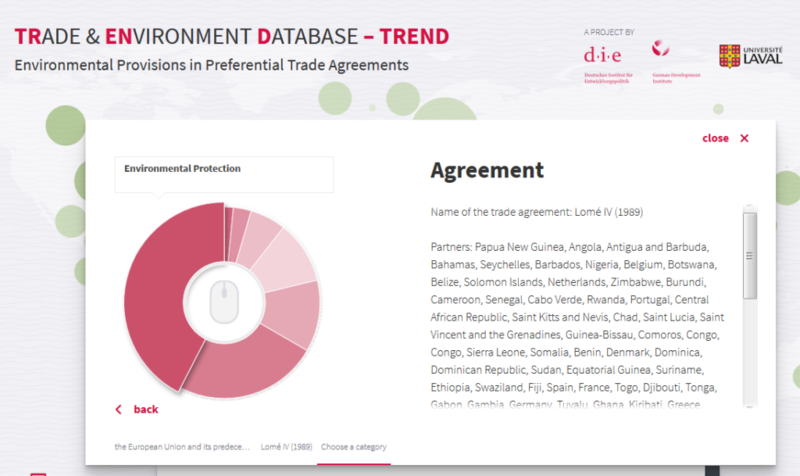 Today, all recent EU trade agreements include provisions on climate change. As a result, 43% of agreements that include at least one provision on climate change are EU agreements. In the 1989 revision of the Lomé Convention, the EU took the opportunity to include a reference to the greenhouse effect. Unfortunately, most trading partners of the European Union, having accepted these provisions on climate change, do not subsequently reproduce them with third countries. But much could be done simply by emulating the most progressive climate provisions in upcoming trade agreements. Learn why a better empirical understanding of environmental provisions in trade agreements is needed!